Wolf sets out to build a multi-faceted narrative, a young black male still living through the anecdotes re-told by his now grieving family. 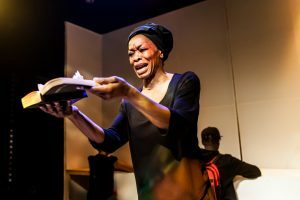 The evening’s strong female presence reminds the audience of just how prevalent the female voice becomes during these times of distress; the mother often times becoming the spokesperson as the media circus capitalise on the heartbreak. Wolf temporarily explores this, but could be examined further. Tom Wainwrights‘s script moves between the lyrical and political, “There was a bit of a scuffle, and I’m sorry to say, he passed away” sets the tone initially for the performance. The cast perform this in chorus both in unison and staggered; leaving the audience intrigued. The political takes shape via the speeches of Kiké Brimah‘s role of the younger sister. Fuelled by the blatant injustice causing the death of her late older brother, she’s driven to beat the system and change the already falsified script the national press appear to mould. She is a character often anchoring this grieving family together, and this avenue is a missed opportunity to learn about the emotional and technical aspects of taking on such a battle as proving wrong doing within the police force. Wolf and Wainwright want to depict the ripple effect a traumatising event has on a family, Urban Wolf portrays a younger brother angry at the fact that he was always been under the shadow of his older sibling, Karlina Grace-Paseda‘s matriarchal role contends with denial and having to bring up 2 strong minded teens and Sacharissa Claxton battles to even has her voice heard as the widowed fiancé. This family dynamic within itself is wafer thin, this basis has the makings for a riveting show within itself, however these characters need a more focused narrative to help the audience empathise with them. I like this blog very much, Its a very nice office to read and find info . Hi there! Someone in my Facebook group shared this site with us so I came to give it a look. I’m definitely loving the information. I’m book-marking and will be tweeting this to my followers! Outstanding blog and great style and design. Spot on with this write-up, I absolutely feel this web site needs much more attention. I’ll probably be returning to read through more, thanks for the advice! I love looking through a post that can make men and women think. Also, many thanks for allowing for me to comment! I go to see every day a few blogs and information sites to read articles or reviews, however this website presents quality based content.